Suddenly the advantage in the GT2 Class of the FIA GT Championship scould be with Ferrari - and EbiMotors might struggle to be truly competitive (as the main / factory Porsche team). AF Corse will, we believe (official announcement due today), enter F430 GTCs for Mika Salo / Matteo Bobbi and Rui Aguas / Jaime Melo (right). Aguas tested for AF Corse recently, while the Brazilian Jaime (pronounced as in French) Melo has been the lead test driver for the new GT2 car from Ferrari / Michelotto. 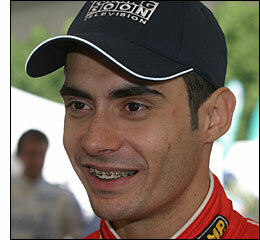 He raced the Risi F430 GTC at Sebring. Matteo Bobbi had an unsuccessful season in Grand Am in 2005, but a partnership with Mika Salo (left) looks as though it will rejuvenate both of their careers. Salo won two races for the official Maserati / Ferrari factory team in 2004, with the Maserati MC12 project. The Ferraris will run on Pirelli tyres. 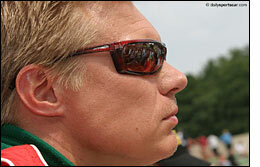 Mika Salo is managed by Nicolas Todt, son of Jean Todt. AF Corse is also expected to make three Maserati Light GT3 cars available for the new European GT3 Championship – with drivers Aguas / TBA, Alessi / TBA and Sperati / TBA. In related news, Pirelli tyre testing at Misano today saw the Ebimotors Porsche of Emmanuel Collard / Luca Ricctelli lapping quickly (a 1:31.8 for the Frenchman – although the Italian had a minor ‘off’). Melo in an F430 GTC was slower, marginally, with a 1:32.0 – but apparently running a different compound to the Porsche. Gollin and Babini were testing the Aston Martin Racing BMS DBR9, but we can’t find out a time for this car, or for Bertolini and Bartels in a Vitaphone Maserati MC12.